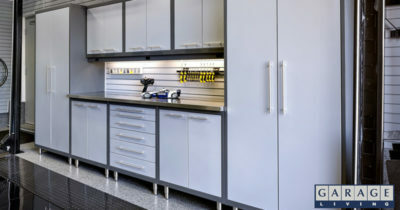 A deep chest freezer offers plenty of extra cold storage in your garage, cellar, or even kitchen if you have the space. There are so many shapes & styles to pick from yet they all pretty much do the same thing: keep your food frozen and easy to access. No matter what type of chest freezer you want I guarantee there’s something for everyone. I’ll cover the absolute best deep chest freezers from all makes & styles offering the pros & cons of each. But if you want a quick dive into the best options check out the table below. I highly recommend reading through all these reviews to see how the different types of freezers stack up and what they offer. Once you’ve thoroughly researched what’s out there you should have an easier time concluding exactly what you want. Spend some time thinking or writing down exactly why you’re getting a deep chest freezer and what you’re looking for. Do you have a set budget? 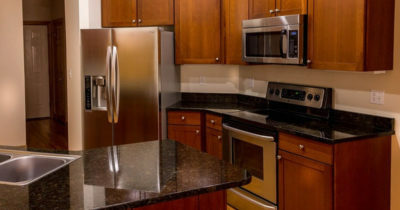 Is there a specific place in your home where you want the freezer placed? 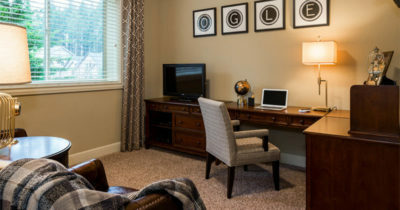 These questions lead to details that help you specify exactly what you’re looking for. The vast majority of deep chest freezers come with power cords measuring between 5′-7′ and few cords drop below 5 feet in length. If you’re ever in doubt then absolutely contact the manufacturer. They can tell you with certainty how long the cord is so you can plan your space. All deep chest freezers are manual defrost freezers as opposed to the automatic defrosting freezers(or no-frost freezers). This means if ice crystals build up in your freezer you’ll need to remove the frozen food and let all the ice melt to clean it out. Usually you should do this about once a year, but you can go longer if you rarely notice any ice build-up. I sincerely recommend watching this 4-minute video created by ABT. 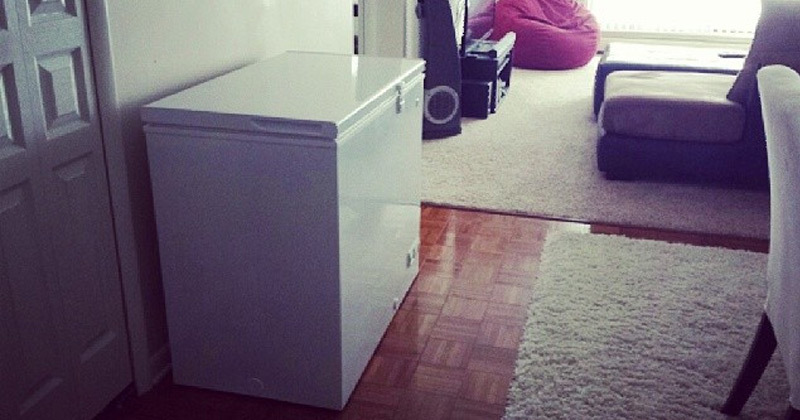 It explains a few big ideas to consider before buying a chest freezer. 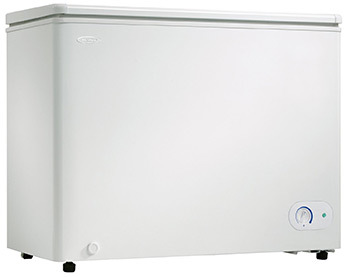 Generally speaking, all deep chest freezers will save you money and keep your food colder for longer. Since cold air tends to sink it’ll generally stay put every time you open up the freezer to grab something. This also makes cooling a lot simpler so you’ll be consuming less electricity. Ultimately the “best” chest freezer is whatever unit meets your needs. 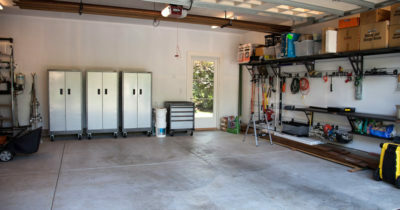 Do you want a large extra frozen storage freezer in your garage? Then you’ll probably want a deeper & pricier model than someone who just wants a little extra storage in their laundry room or basement. Many freezer manufacturers will actually say you can’t keep the freezer in an unheated garage or basement. But many customers say otherwise and generally all of these freezers should be fine, even in below-zero temps, so long as they don’t get soaked. Deep chest freezers will keep your food colder for longer, run quieter than regular freezers, and generally pull less electricity. So if you’re okay with manual defrosting maybe once a year then you’ll just need to consider what exactly you’re looking for and what type of freezer best fills those needs. So without further ado let’s dive into the best picks! The Hisense FC72D7AWD is clean, simple, and very efficient. The unit is all white and has a handle in the center of the lid for easy access. Inside it feels very deep and surprisingly clean. The freezer comes with about 7.2 cubic feet which feels very spacious(equivalent to 204 liters). All material inside is made of solid steel and keeps very cold. Every new Hisense freezer comes with one free wire basket which sits at the top rim inside the freezer for easy access. 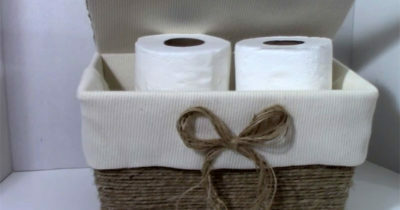 But you can buy additional baskets if you want to add more. I’d estimate there’s only room for about 3 baskets max before you block access to the bottom of the chest. 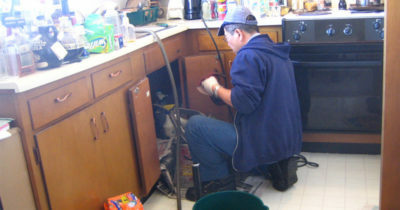 At the very center of the freezer’s floor you’ll find a drain which is used while defrosting. Just remove all items from the freezer, turn it off, and let it sit for 8-24 hours. The ice should melt away and drain out leaving you with a clean interior. At the bottom-left corner you’ll find a temperature knob which lights up when powered on. This offers a way to check at a glance if the freezer is running. However the freezer dial does not offer specifics so you’re really guessing at temperature. This is true of many chest freezers so it shouldn’t be a huge deal. Overall the price, size, reliability, and structural design make the Hisense one of the best chest freezers you can get for common everyday household use. 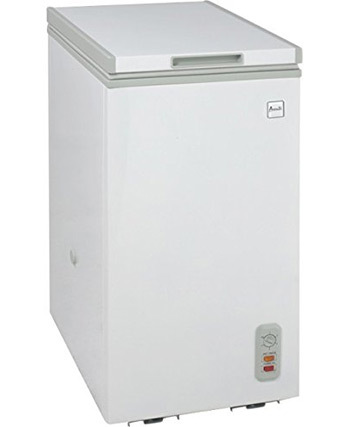 Danby is another reputable brand of chest freezers and this particular Danby freezer has loads of options. You can pick between six different sizes all with the same internals but different shapes. In case you aren’t familiar with the vernacular here, any upright freezer is basically the “normal” freezer you see in every home. The doors open “out” and the design is built vertically. Chest freezers are usually cubes or rectangles and they open “up” where you pull the top up and reach into the chest. Depending on how much space you’re willing to take up you can go as low as the small 3.8 cubic ft model or check out the larger 7.2 cubic ft chest freezer. Every unit comes with one wire freezer basket and one built-in wire divider to organize your food. Since chests don’t have shelves they typically have either baskets or dividers(or both in this case). The Danby DCF072A2WDB1 is energy efficient and uses insulated foam in the sides to keep the chest running optimally. It’s built with steel inside and the outside uses a plastic coating. It can fit anywhere from a garage to a cellar or in your kitchen. Inside the freezer you’ll find a small drain which is smaller than most. This is unfortunate because the Danby tends to build up frost a bit quicker than others. It can also lead to ice forming around the rim/edge of the chest seal which can be a pain when opening. This may be from the foam insulation or it might just be from the materials used in the chest. Either way I wouldn’t consider it a deal breaker, just might need a good defrosting once or twice a year. Anyone looking for a massive garage/basement freezer will adore the Frigidaire 74″ chest freezer. 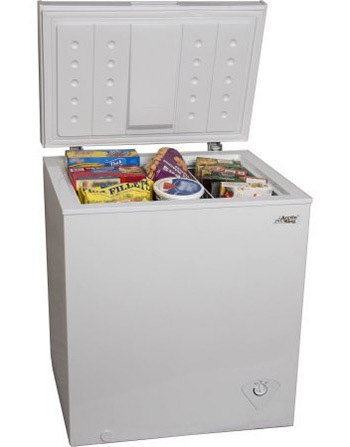 It is by far the deepest and widest freezer in this post, and it’s the best one you’ll find in this price range. Measuring almost 22 cubic feet inside this thing is absolutely massive. Because of the size you can easily fit 5-6 storage baskets along the top and still have access to the bottom. This unit comes with 4 free storage baskets so you probably won’t need to buy any extras. Frigidaire is trusted in the home appliance market so this chest freezer is built by pros and made to last. Whenever you open the freezer it automatically turns on an LED light attached to the underside of the lid. This makes rifling through your frozen goodies a whole lot easier, especially in a dark garage or basement. And the interior baskets can slide along the grooved rim so you can dig around the freezer with relative ease. The very bottom of the chest has optional dividers to help with organization too. You can use this freezer for anything you buy at the grocery store and even for game meat from hunting. 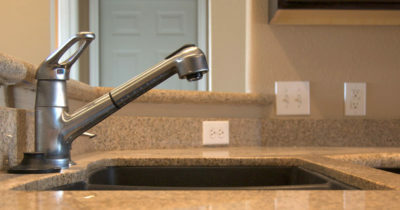 It’s energy star rated and guaranteed to run at the most efficient levels possible. Not to mention ice buildup is almost nonexistent so you shouldn’t need to defrost very often. Most freezers are colored white or silver so it’s nice to see the Igloo FRF454-B-Black as a sleek dark alternative. If you prefer the darker color scheme for a chest freezer then this Igloo is the perfect model. 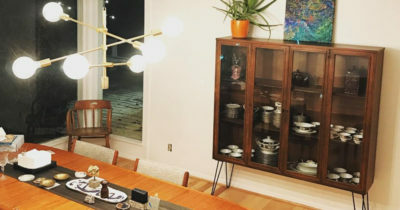 It’s only about 2.5 feet wide and less than 2 feet deep so it can fit snug against a wall or countertop. The 5.1 cubic ft interior may seem small on paper, but looking inside you’ll be surprised how much room you have. Not to mention this comes with a free wire basket for extra storage. The manufacturer’s manual recommends keeping this freezer in a space that’s around room temperature(like a kitchen or furnished basement). But this seems like more of a generic cover-all than a practical warning. There are many people who keep chest freezers in the garage with no issues. The biggest problem is with fridge/freezer combos because they need to regulate temperature a lot more. In my opinion this deep chest freezer can work fine in an unheated garage. The biggest issue would be rust on the outside or condensation building up on the coils. But if you keep it away from moisture-prone areas it should last for years. 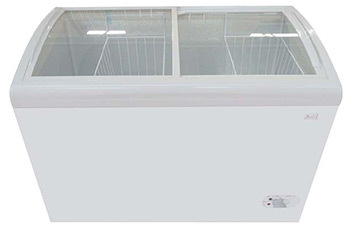 Small and sleek best describes the Avanti CF6216E chest freezer. 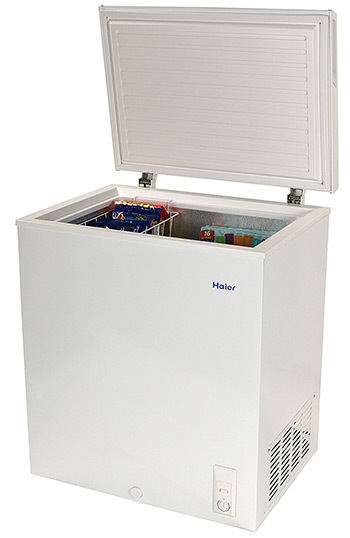 This unit is designed very thin and tall but it opens from the top like a typical chest freezer. Keep in mind this is one of the smallest freezers you’ll find anywhere. 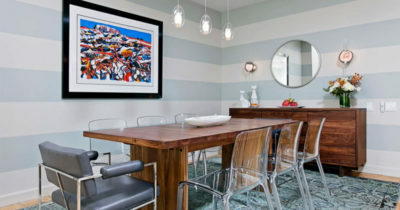 It was designed for very small spaces like apartments, condos, or cramped basements/garages. A typical milk crate measures about 1 cubic foot in volume, so imagine 2 milk crates’ worth of space. That’s what you’ll get with this unit. If that’s not enough space then you’ll definitely need something bigger. On the plus side it is very small and super easy to fit anywhere. If you have a couple feet next to your countertop you can fit this thing right in your kitchen. It’s also very quiet and comes with a drain at the bottom so it’s easy to defrost. And at only 50 lbs it should be no trouble lugging around the house or getting into a moving van. Probably the worst thing about the Avanti is the price(considering what you get). 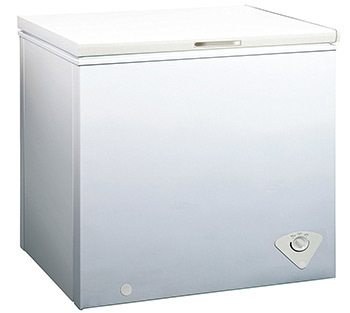 You’ll find plenty of chest freezers cheaper than this one that offer more than double the interior space. 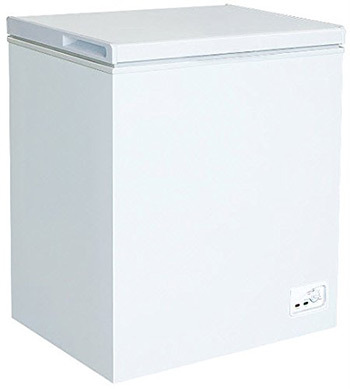 I only recommend this for people who really want the smaller unit and don’t have much space for a chest freezer. Otherwise it’s likely to be somewhat disappointing. 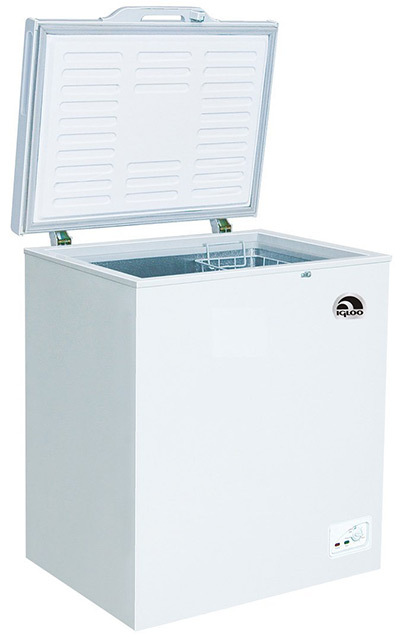 The Midea WHS-258C1 freezer is a solid mid-sized chest freezer measuring over 3 feet wide and just under 3 feet deep. It has a 7 cubic ft interior which should be plenty of space for a smaller family(2-4 people). It comes with one removable storage basket and it’s a big one so there isn’t much room for a second basket. This freezer feels much deeper than it looks so you’ll have to really dig to reach the bottom. This is where some people may not like this design. 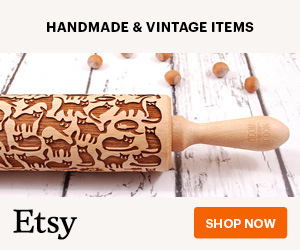 It can be hard to use if you cram it with food. They all have very similar shapes but the smallest unit is taller rather than wider. This lets you pick & choose which style you like best and how you’d want it to fit in your home. But it does have an adjustable thermostat on the outside with three settings: min, max, and off. By default you won’t be able to really tell the internal temp, but you can get a small thermometer to keep inside. The top seal fits great and keeps all food inside nicely frozen. Overall I have to give this chest freezer a high mark for an all-around great buy. I really like the design and style of the RCA-Igloo 5.1 cubic ft freezer because it looks just like what you’d expect of a modern chest freezer. It’s a pristine shade of white with back latches for the top door hatch. The interior uses a strong steel covering along all the walls and it’s well insulated from every angle. Towards the bottom-right corner you’ll find a thermostat dial that’s easy to adjust with many different temperature settings. Inside the unit you’ll get 1 free wire basket for holding frozen products and a central drain for easy defrosting. Ice that melts into water down this drain eventually percolates into a drain pan which evaporates over time. Little-to-no maintenance required once you get it setup. For a 5.1 cubic ft cooler this is surprisingly narrow. It should fit in any room you need including the garage or basement. It’s easy to reach even towards the very bottom and the temperature gauge is super simple to use. The best part is the insulation inside which really keeps your food frozen. You may need to crank down the heat to get it going but once it hits the right temp it’ll stay locked in. Typically these types of commercial coolers are bought for gas stations selling ice cream and frozen snacks. But the Avanti CFC86F0WG chest freezer can work very well in a garage or basement where you’d like to store extra goodies. It does look large from the photos but it only measures 43″ wide(about 3.5 feet). And with an internal space of ~8.6 cubic ft(about 9 milk crates) this freezer offers plenty of space without taking up a ton of room. The top has two sliding drawers with a reinforced see-through barrier. This makes it easier to find what you’re looking for at a glance. And there’s an optional lock for the doors if you want to keep them secured at all times. As an added bonus you’ll get three(3) removable wire baskets to store your frozen goods above the rest. This freezer only has room for 3 baskets so it’s best to use 2 and leave some space to dig deeper. On the front you’ll find an adjustable thermostat with a power light as well. It works just like other home chest freezers but this one takes the style of a commercial design(including rollers for easy transport). Granted you can find other chest freezers that keep the box shape while still looking more “residential”. 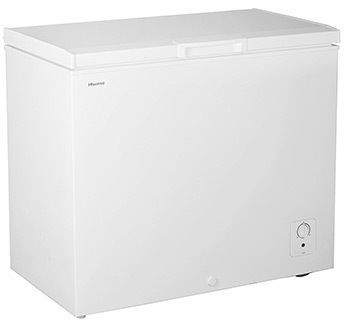 The Hisense FC72D7AWD freezer measures 7.2 cubic ft which is only about 1 cubic foot smaller than this Avanti model. But if you like the clear top and don’t mind the commercial design this freezer is simply astounding. It’s large enough to fit plenty of frozen goods and since it’s wider than taller it’s easy to access everything at once. 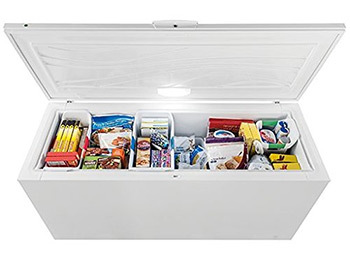 This Arctic King chest freezer is built to last and it’s extremely simple to setup. This also comes with optional back rollers and with this being only 70 lbs empty you can move it around comfortably. Some people don’t like the roller wheels because they can look tacky, not to mention it may not feel as secure on the ground. If you don’t like them you can find similar chest freezers with without this option. The thermostat dial on the front isn’t anything special but it does the job. With only two settings(max and min) you don’t have much opportunity to work with it. But the default settings work fine and it has a small power indicator light to let you know it’s running. Unfortunately this brand doesn’t have any other chest freezers to look into. Their 5 cubic ft freezer is the largest I can find with other options for a 3.5 cubic ft freezer that looks similar but actually stores less stuff. So if you like the Arctic King design then their 5.0 chest freezer is likely the best option. 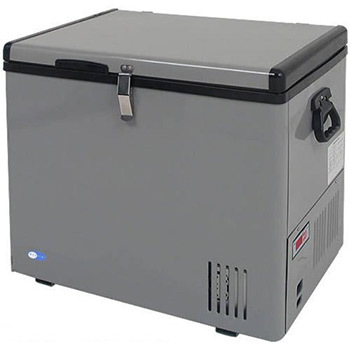 If portability is a concern then you might like the Whynter FM-45G portable chest freezer. It can work as both a fridge and a freezer with a proprietary “fast freeze” mode adjusting to -8°F within minutes. On long trips this needs to be plugged into your car outlet to keep the temperature consistent. But if you’re bringing it to a sporting event or out for a small day trip the insulation might keep the temp low enough. The cable measures about 6″ long which should be more than enough to reach the car charger even from the backseat. While driving around the lid will stay closed tight and can be latched closed. All of these are very small compared to most other freezers listed in this guide. But this is also unique in that it’s built to be moved around. It comes with a top latch to keep it sealed and a digital LED temperature reader so you can keep everything inside cool as a cucumber. There aren’t too many portable chest freezers that can double as at-home chest freezers. This is one of the few models that offers a decent interior with both fridge & freezer settings, plus has a design that can be kept in the garage or brought on a road trip. Let me start by saying this freezer is a bit ugly. It looks like the traditional refrigerators you’d expect to find in the 1980s and the off-white eggshell color doesn’t look amazing. 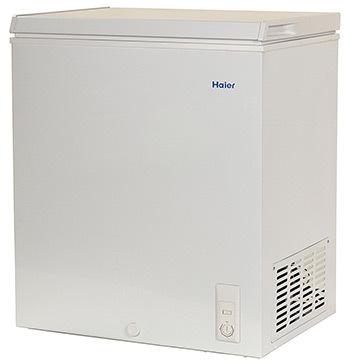 That being said the Haier HF50CM23NW chest freezer is a powerful unit with a very low price tag. It comes with 5 cubic feet inside and an easy-to-access drainage plug for manual defrosting. This plug can be found in the very front beside the temperature gauge. Surprisingly this gauge actually has settings(1-6) rather than a simple “min” or “max” reading. I do not like how the chest grips are placed on the side of the unit, meaning to open it up you’ll need to grab underneath the sealed top or lift from the sides. This feels awkward and makes me appreciate the other freezers with a front grip. If you can put that aside then you’ll quickly grow to love this freezer. It may not be the prettiest thing to look at, but it damn well works and does the job you’d expect. Not to mention the price is pretty good for the size. The last freezer I wanna mention is the humongous Zebra BD/BG-350. It measures just over 4 feet wide and contains 13.5 cubic ft of freezer space(this would fit about 13 milk crates). Zebra’s sleek design makes this chest freezer blend with any style of home decor. It comes off as just another freezer but it’s easily one of the largest you can get for an extremely reasonable price. Compared to the Avanti display freezer this Zebra model is much more powerful and even larger, all with a simple coat of white that doesn’t stand out too much. The lid has a built-in light that helps you dig around the massive 4+ foot long freezer. It comes with one wire basket but you’re free to add more if you want the space. In the bottom-right corner you’ll find a control knob for adjusting the temperature and checking for power. Internal temperatures can climb to just above freezing(~38F) and drop as low as -1° F.
The cost/benefit on this freezer seems incredible considering the size. If you halved the cubic space and looked for a comparable unit you’d end up paying more. The only problem is making sure you have enough space for it! Truth be told if you’re working with a very low budget you won’t have very many options. But naturally there are plenty of budget chest freezers to pick from, the best of which is the RCA-Igloo 5.1 Cubic Ft Freezer. Everything about this unit fits right in line with typical freezers. You get a manual dial for adjusting temperature, an internal drain for defrosting, and just over 5 cubic ft of space. This won’t hold much but it’s enough for home use. And the design uses a clean white style found in most appliances. 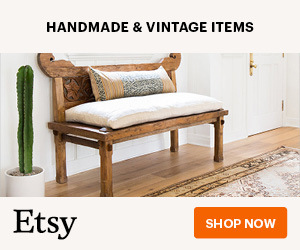 This should feel right at home anywhere in your house and you can pick it up on a budget. It’s possible to find other freezers at lower prices but you’ll typically have to sacrifice somewhere. This could be sacrificing space, or sacrificing energy efficiency, or any other type of design flaw. But the RCA-Igloo freezer doesn’t have much to sacrifice making it an excellent budget pick. Granted it’s not without flaws, but the worst is the difficult temperature control. 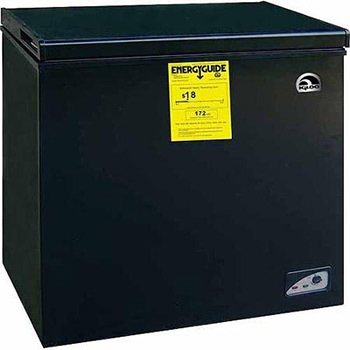 Depending on where you store this freezer it may need to be cranked year-round to keep a good internal temperature. That being said it’s also pretty small so the actual electricity use is minimal. As long as you don’t overload the thing with frozen foods you shouldn’t have any problem keeping this cold during all seasons. I sure hope this list offers enough variety and information to help you on your freezer quest. 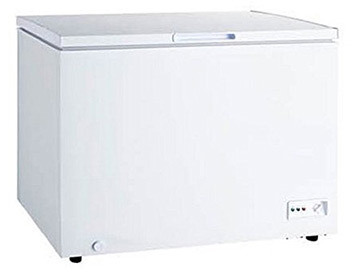 If I had to pick an overall #1 best choice it’d be the Midea chest freezer for its simple design and variety of sizes(3.5, 5.0, and 7.5 cubic ft). Most people just need a mid-sized freezer for storing extra food around the house. Midea offers the perfect solution in various sizes that can fit in the garage or even right in the kitchen. But it’s by no means the best choice for everyone. Figure out how much space you have and what sort of budget you’re working with. Once you know exactly what you need in a chest freezer you can organize your top picks and find one that suits you best.